Bo Sanchez, through The Truly Rich Club, is helping more Filipinos learn how to invest in the stock market. Not only is he an effective teacher and mentor, he is also an inspiring one as well. In fact, even his kasambahay's are investing in the stock market. In the process, they have uplifted themselves and gotten out of the usual cycle of work, send money to relatives, experience zero savings. Nowadays, it's work, set aside funds for themselves (and invest in the stock market on a long-term basis), set aside funds for emergencies (for family and relatives), and look forward to a brighter financial future. 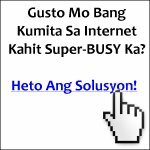 More and more Filipinos are discovering the time value secret of money. And more importantly, these Filipinos are taking action. That's why I envy young Filipinos. If I knew back then what I've been learning inside Bo Sanchez' The Truly Rich Club, I would've started earlier (even as a student), and 20 years later (which is today), I'd be reaping the benefits. » Click here and look inside the Truly Rich Club of Bo Sanchez.